Agates with horizontal chalcedony layers, among collectors well known as Uruguay bands or onyx, have been fascinating but controversial. Formations of this type are found in cherts, too (Fig1). They are abundant in the Lower Devonian cherts from Rhynie, Scotland, but less so in other cherts. They have repeatedly led to the idea of a formation process by silica deposition in a cavity with varying water levels. Despite of contrary evidence, that seemingly plausible idea is still widespread. Refuting that idea is so simple that one wonders why it is still found in recent scientific publications, as in [1,2], for example. 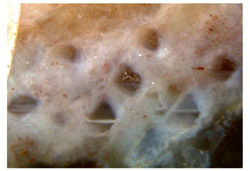 Fig.1: Stack of coloured layers in a cavity in Rhynie chert, among them empty ones partially filled with quartz crystals; rhizome cross-section with rhizoids below indicating the down direction. Photograph by J. Gardavsky . 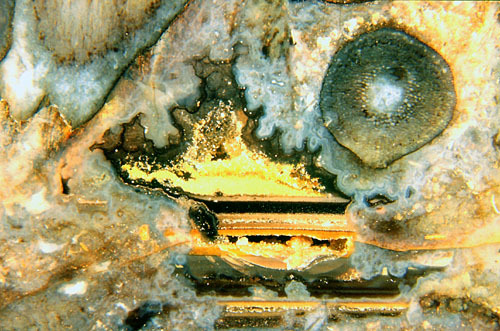 Lower Permian chert from Döhlen Basin, Germany. If a water surface had been involved, the bands would not go straight through but turn upwards at either end to form a curve known as a meniscus. Especially telling are bands in very small cavities. If a mm-size cavity with wettable walls were half filled with water, the air would be forced by the water into a spherical bubble so that there were no plane water level but a spherical surface. As even the smallest horizontal bands in chalcedony are exactly straight (Fig.2), it must be concluded that the bands were not formed at a liquid surface. The fact that a tiny volume of air in water is shaped as a bubble is due to the dominance of surface tension over gravity at small scales. This has been ignored in  where the effect of gravity on silica sedimentation within plant cells is considered while the much stronger effect of surface tension is not. Dissolved silica or silicic acid is known to form molecular clusters of various size. The clusters can become so large that they settle and form a rather well defined horizontal boundary. Bonding between the clusters eventually turns the emulsion or slurry into gel, and crystallization may turn the gel into chalcedony. This process can be modified by the presence of small amounts of other minerals which also provide colour, and by changing parameters as temperature, pH-value, etc., and thus it may proceed at differential rates under varying conditions, resulting in bands of various aspect and microstructure as it is well known from agate bands and seen in Fig.1. 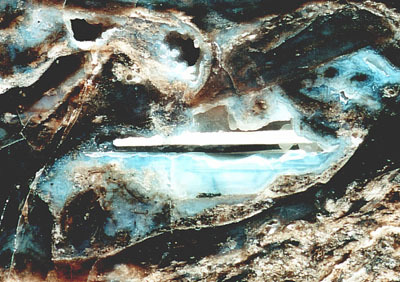 Fig.3: Horizontal chalcedony plate suspended in a cavity in Rhynie chert, serving as evidence for the dissolution of layers below. The changing conditions can even reverse some stage of the process so that a deposited layer may eventually dissolve. If the dissolving layer is not the uppermost one, a gap arises in the stack of agate bands which may never close again. Gaps of such origin are not rare in the Rhynie chert. They make an easy explanation for the thin horizontal plates occasionally found suspended in cavities in the chert (Fig.3). Note that one need not concoct scenarios involving liquid flow for substance transport into and out of the cavities, as often done in attempts to explain agate formation. Transport of silica by diffusion through liquid, gel, or along grain boundaries of crystalline phases would do.